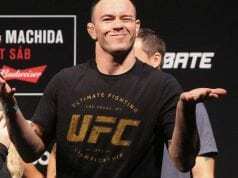 Colby Covington believes Ben Askren should give his Hodge Trophy to Robbie Lawler after their recent fight inside of the Octagon. The former interim UFC welterweight champion is known to be outspoken and did just that about this fight. In fact, he had one of the best seats in the house to watch this fight near the Octagon. 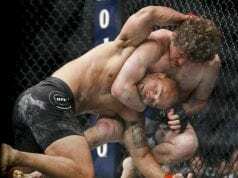 Askren beat Lawler at UFC 235 earlier this month from the T-Mobile Arena in Las Vegas, Nevada. In round one, Askren locked in a bulldog choke and Herb Dean stopped the fight, but Lawler claimed to be awake and was. Since then, many people have expressed their interest in seeing this fight again including UFC President Dana White due to the way that it ended. Covington was not impressed by what he saw from Askren in his promotional debut.